Not to be confused with J. Edward Roush. Edd J. Roush (May 8, 1893 – March 21, 1988) was a Major League Baseball player who was elected to the Baseball Hall of Fame in 1962. He played the majority of his career at center field, and had his best years with the Cincinnati Reds. Roush made his major league debut on August 20, 1913 for the Chicago White Sox. He switched to the fledgling Federal League in 1914 and spent two seasons with the Indianapolis Hoosiers, who became the Newark Pepper in 1915. In 1916, he split the season between the New York Giants and the Cincinnati Reds. With the Reds from 1917 to 1926, the left-handed hitting Roush never batted below .321, batted .352 in 1921, and won the National League batting title in 1917 and 1919. He was an instrumental part of the Red's World Series championship in 1919, and for his entire life he insisted that even if the White Sox had played the 1919 World Series on the level, the Reds would have won. Roush led the league in Slugging average (.455) in 1918, in Doubles (41) in 1923, and in Triples (21) in 1924, and was renowned as having the best arm of any outfielder in his era. He held out most of the 1922 season over a salary dispute that continued into spring 1923. 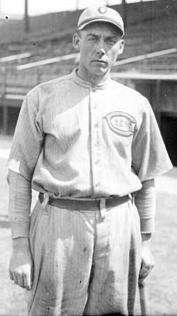 Roush played for the New York Giants again from 1927 until 1929, and then rejoined the Cincinnati Reds for a single season in 1931 before retiring. He sat out the 1930 season over a salary dispute. Roush finished his 18-year career with a .323 lifetime average, 268 stolen bases and 182 triples. He never struck out more than 25 times in a season and had 30 inside-the-park home runs. Roush, who used a massive 48-ounce Louisville Slugger (the heaviest bat used in baseball), claimed that he never broke a bat in his big league career. Roush served one season as the Reds coach alongside his good friend, manager Bill McKechnie. During his career he had saved his money and was able to retire after he finished playing. He built a house in Bradenton, Florida, and used it as a winter residence. He would frequently attend Spring training and tell stories of the old days. Roush devoted most of his time in his hometown of Oakland City, where he served on the town and school boards and ran the Montgomery cemetery for 35 years. In addition to Roush's selection into the Baseball Hall of Fame in 1962 (chosen with Bill McKechnie), he is also a member of the Cincinnati Reds Hall of Fame, being inducted in 1960. Considered the greatest player in Reds' history at the time, Roush was invited to throw out the first ball at the last game at Crosley Field on June 24, 1970. Joe Morgan called Roush "the best of us all". In 1981, Lawrence Ritter and Donald Honig included Roush in their book The 100 Greatest Baseball Players of All Time. Roush died at the age of 94 on March 21, 1988, in Bradenton, Florida. At the time of his death Edd Roush was the last surviving Federal League participant. 1 2 Suehsdorf, A. D. (1978). The Great American Baseball Scrapbook, p. 56. Random House. ISBN 0-394-50253-1. ↑ "Ed Roush Declines to Play With Reds: Star Outfielder Says He Will Join an Industrial League Team This Season", The New York Times. April 6, 1923. Retrieved March 14, 2011. Page 13. ↑ Sandoval, Jim. "Edd Roush". SABR. Retrieved 8 May 2015.